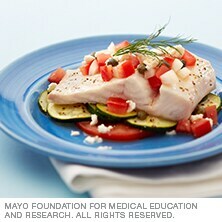 Fish and vegetables are key components of a healthy diet, such as the Mediterranean diet. Set the best 4 tomato slices aside. Chop the remaining tomatoes into small cubes. Place the tomato cubes into a bowl and add the onion, capers, balsamic vinegar, olive oil and feta cheese. Stir to mix. Place the oven rack in the upper position and heat broiler to high. Line two rimmed baking sheets with aluminum foil and spray with cooking spray. Place zucchini rounds in a single layer on one baking sheet and fish fillets on the other sheet. Spray the top sides with cooking spray. Place the zucchini under the broiler for about 1 minute. Turn and season with half the lemon pepper. Broil for another minute and move the baking sheet to the bottom of the oven to keep warm. Place the fish fillets under the broiler for about 3 minutes. Turn and continue broiling until the fillets spring back to light pressure, about 3 to 6 minutes. Cooking time will depend on the thickness of the fillets. Season with the remaining lemon pepper. Place 1 slice of tomato on each of four plates. Arrange zucchini in an overlapping circle on top of the tomatoes. Place a fish fillet on the zucchini and top with the diced tomato mixture.